Looks a little like something from The Matrix. Ahh, the un-cuddle-able child. Now I can identify. Having a baby who doesn’t enjoy being held is one of the most difficult things I’ve had to come to terms with as a new mom. In the first few weeks of C’s little life, I heard complaints from other moms along the lines of, “My arms are going to fall off” or, “If I put the baby down, she cries until I pick her up again.” Hearing this aroused an insane jealousy in me. Maybe it’s my fault, I thought. Maybe Seabass just doesn’t like me. His own mother. Why would I think such crazy thoughts? Because more often than not, when Seabass cries it’s because he wants desperately to be put down, not picked up. But he doesn’t want to be put down into something motionless. No, no, it has to be moving, always moving, majorly moving, gotta move, let’s move move MOVE OR ELSE I’LL SCREAM AND YELL AND SHRIEK AND MAKE ONLOOKERS THINK IT’S JUST A MATTER OF TIME BEFORE CHILD PROTECTIVE SERVICES KNOCKS ON YOUR DOOR, LADY. 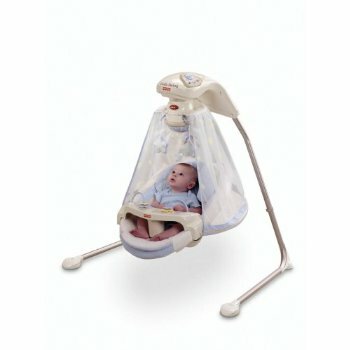 So, to keep Mr. C happy and moving up until the last moments of consciousness every night, I swaddle him up like a mummy, nurse him, and then place him in a cradle swing made by Fisher-Price called the “Starlight Papasan” (whose name kind of creeps me out, but I’ll leave Fisher-Price to deal with any vernacular confusion on that one). Sure, I’d rather cuddle and rock him to sleep in my arms, but that just ain’t in the cards. Good question: What happens when the motor can no longer support Seabass’ heft? The manual says the Starlight Papasan can handle anything up to 22 lbs, but it’s already creaking along with a good amount of effort at 15+ lbs. Better question: What happens when Seabass decides he doesn’t like the swing anymore? I literally do not know what I’ll do when and if that happens. Panic, I guess. And probably cry a lot. I had Luke in the papasan til he was about 25 lbs, and mine creaked the whole time! I think that is what they do once they lose the newness! The papasan was his crib for the first 5 months, I loved that thing! Ha, love it! Any suggestions on how to rock a 12 and an 8 year old to sleep? Wish they made a machine for that age group. I hear ya my dear!! Really I do. I know the feeling! My daughter was the one who didn’t like to be held…she is still not a touchy-feely person, 17 years later. She was always happiest atop the dryer as it whirled away. Oh my gosh! That video is hilarious! I love it. And Scarlett loved it too, because, thanks to her grandma, she loves Pink Floyd. Dudes. I love the audio accompanying the video. Your timing is impeccable. Your posts are great – I’m cracking up at “bring on the evil machines.” I too read how swings are just another sleep prop, etc. etc. and when I had my Julian I was determined not to use any…well, there were many things I was determined not to do and let’s just say I tried them all! I can really relate to your posts!